A newly published study from MIT and Massachusetts General Hospital reveals how cancer cells latch onto blood vessels and invade tissues to form new tumors — a finding that could help researchers develop drugs that inhibit this process and prevent cancers from metastasizing. “Endothelial cells line every blood vessel and are the first cells in contact with any blood-borne element. They serve as the gateway into and out of tumors and have been the focus of intense research in vascular and cancer biology. 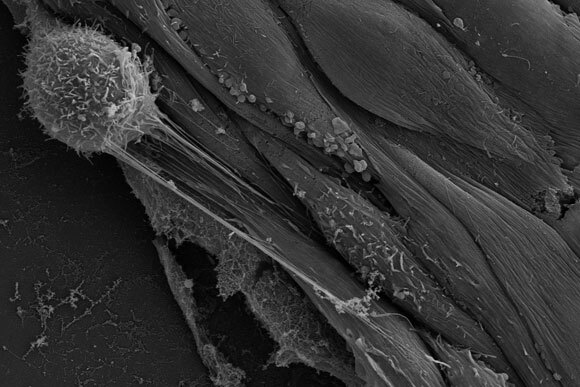 These findings bring these two fields together to add greater insight into control of cancer and metastases,” says Elazer Edelman, the Thomas D. and Virginia W. Cabot Professor of Health Sciences and Technology, a member of MIT’s Institute for Medical Engineering and Science, and one of the leaders of the research team. The lead author of the paper, which appears in the December 16 issue of Nature Communications, is Yamicia Connor, a graduate student in the Harvard-MIT Division of Health Sciences and Technology (HST). The paper’s senior author is Shiladitya Sengupta, an assistant professor at HST and at Harvard Medical School. 1 Comment on "New Research Reveals How Cancer Cells Escape Blood Vessels"